We are what we choose to be or so goes the saying someone said once upon a time and has been repeated countless different ways a billion times since. In the case of Billy Hope (Jake Gyllenhaal) though, one seriously begins to wonder what kinds of choices dictate a meteoric rise and then a literal loss of everything precious in his life. Is it simply defending his wife? Getting angry over a fellow boxer challenging his strength and insulting his woman in the process? Would we have done something different than Billy or was he destined for this path of loss and eventual redemption? That seems the simple answer, yes. You strip away the key stone and the rest of the rocks come tumbling down. Why does such an insignificant seeming choice dictate the remainder of your life? It is an impossible question to answer and one that would make anyone want to end their own life were they to contemplate it for too long. Yes, life is about choices-some that we are proud of, others that we will regret and then there are the ones that will haunt us forever. When we meet Billy Hope he is on the top of the world. He is the undefeated lightweight champion of the world at 43-0, he loves his wife Maureen (Rachel McAdams) more than anything and they have a young daughter, Leila (Oona Laurence), who Billy adores. He seems to make more money in one fight than most pro athletes do in a season as he, Maureen and Leila reside in a mansion outside of New York City while his boys (who came up with him through an orphanage in Hell's Kitchen as did Maureen) hang out and collect benefits. His manager, Jordan (50 Cent), seems more than a little sleazy, but his only real point of stress in the opening moments come from fellow boxer Miguel Escobar (Miguel Gomez). After the opening fight in which Billy takes a beating before finding the fuel to light his fire to deliver a knock-out punch, Escobar shows up to taunt the still undefeated champ into fighting him next. Proclaiming Billy's afraid to go against a real fighter, Escobar knows just how to get to Hope. It is in the split second decision to react to Escobar's taunts rather than think it through that Billy makes the choice that will alter his life and his career in unbelievably depressing ways, setting Southpaw up as little more than a familiar story that is carried by great performances. under the supervision of social services worker Angela Rivera (Naomie Harris). After that last successful title defense the film opens with, Maureen is insistent that her husband take some time off in order to allow himself to heal as well as spend some quality time with their family. Jordan has other plans though as he looks to sign Billy with HBO for a two year, three fight deal worth $30 million. It is seemingly a couple nights after Billy's last match that he and Maureen attend a charity event for the boys club that was integral in introducing a young Billy to boxing. As Billy and Maureen are leaving the event, where Billy was asked to give a speech, Escobar gets in his verbal jabs that force the situation to escalate quickly and result in Maureen being shot and killed by an unknown gunman in the midst of the melee. As a result of this tragedy, Billy is unable to keep himself from spiraling into a self-destructive pattern. He can't stop drinking, he totes weapons around as he heavily contemplates suicide (you can feel Gyllenhaal's performance telling us Billy would easily kill himself to see Maureen again) and eventually running his car into a tree before the situation is finally brought in front of the judicial system. After reviewing the case and the unfortunate set of circumstances, the judge places Leila in the care of social services and requires Billy to prove he can kick his bad habits and get his act together before seeing his daughter again. Billy comes to learn his finances are in shambles and that the professional boxing association has stripped him of his title in quick succession. After hitting rock bottom in every way imaginable, Billy seeks the help of Tick Wills (Forest Whitaker), a trainer who agrees to give Billy a job as a janitor and possibly even help him get back in the ring. Directed by Antoine Fuqua (Training Day, The Equalizer) and written by Kurt Sutter (Sons of Anarchy, which I didn't get into) Southpaw is a movie that seems afraid to admit to itself what it actually is. This is a movie about a man who gets hit for a living and the whole story operates as one big metaphor for Billy's punch drunk mentality that sees him being beat down to a certain point before he can conjure up enough will to retaliate. This is all fine and good, but Sutter seems to want this to be more than that. He wants it to be something deeper, something more mythical in a way that this protagonist is larger than life and that it's something of legend that he came to be on top once again. It is like a Greek tragedy with a Greek God at the center of it and I can appreciate those types of aspirations, but the problem this leads to is an overall story that feels unsure of itself. There are parts of the film that really work, individual moments that are beyond engaging and yet as you watch the film unfold it can't help but feel stilted for long stretches, as if the story is looking for somewhere to go other than the obvious route. Fuqua is all about the process of things as the opening shot is that of Billy getting his hands wrapped, while the director also keeps his camera lingering after Maureen's funeral just long enough for Billy to see the cemetery groundsman pull up to move the flower arrangements and begin lowering his wife into the ground. By the time it realizes it can't come up with anywhere else for Billy's story to take us though the film has dragged on for too long and has to hurry to try and catch up with itself in the last twenty minutes. There was such a momentum in the opening scenes, especially given how Fuqua captures the boxing matches with his cameras on the boxers in a GoPro style that puts us in the middle of the fight and elicits a visceral reaction. The film begins to pace itself slowly after the death of Maureen, but it is in such a way that it feels meandering rather than like the methodical character study it wants to believe it is. Billy Hope and his new Trainer Tick (Forest Whitaker) prepare themselves for a return to the ring. The music can be a little much at times (the fine enough score comes to us from the late James Horner), the melodrama a little heavy-handed and the questions of mortality and reason are a little too broad to really cut to the core, but Southpaw still comes away as a solid movie. This is largely due to the strong performances scattered throughout. First up is Gyllenhaal who has clearly been on something of a roll lately, re-defining his place in the public eye and universe of film as one of the most gifted actors working today. While Southpaw isn't the strongest film on his resume as of late, his performance alone is another in a long line of impressive turns that see the actor fully inhabiting the world of his character. You know a performance is impressive when you as a viewer can't leave the headspace of the character after the film ends and somehow Gyllenhaal is able to instill the guarded movements, distinct vocal patterns and short tempered psychology of Billy Hope in us over the course of two hours. Billy isn't the most intelligent person, in fact he's rather easily deceived when it comes to those close to him, but we never think of him as a dummy. Billy is simply a man who's made some bad choices that led to worse circumstances, but who clearly doesn't deserve the unrelenting bleakness those decisions put in motion and so we inevitably root for him. McAdams is also especially good here as she only has a limited amount of time to set-up her character and her connection with Hope that shows the history between the two and the how and why of Billy trusting her more than anyone else in the world. The scene in which Maureen dies could have been executed more dramatically, but the acting from both Gyllenhaal and McAdams is nothing short of incredible. 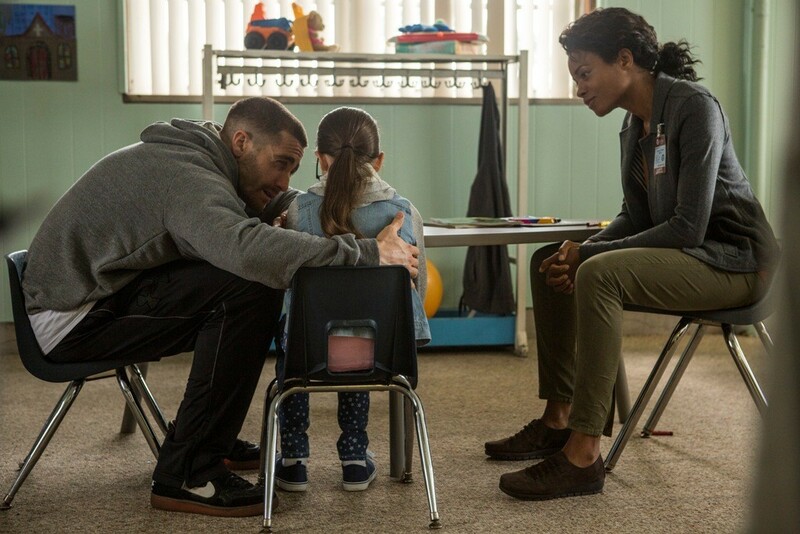 While Naomie Harris has little more than a thankless role I did enjoy the developing relationship between Hope and Whitaker's Tick. The two men slowly learn to trust each other, Tick helping Billy on the journey towards accepting his wife's death, reclaiming his daughter and finding glory in the ring again. Southpaw is a boxing term that designates the stance where the boxer has his right hand and right foot forward, leading with right jabs, and following with a left cross right hook. This is a style that Billy adapts once he begins training with Tick. The biggest take away from his time with Tick is how to play defense, how to block some of those oncoming punches he once took to fuel his rage. The crux of Southpaw is Billy learning to channel that rage into the right places and subduing it in others. His relationship with his daughter becomes his sole focus after the death of her mother and after his behavior breaks her heart to the point she feels she's lost both of her parents. The performance from Laurence is one of note as it is what holds the most emotional weight and really gets to the heart of what it seemed Sutter wanted his story to be from the beginning. Southpaw is a good movie, weighed down by its own inauspicious tone and raised by it's handful of solid performances. Cut the attempted subtext, let the simple story breathe and allow the performances to do the rest and you might have something more compelling than this version of the film that is trying too hard to be as much.